The U.S. Bishops are issuing a call to Catholics to address this sin in our communities, nation and world. Bishop George V. Murry, SJ, of the Diocese of Youngstown, Ohio, chairman of the U.S. Bishops’ Ad Hoc Committee Against Racism, has is calling on Catholics and all people of faith to observe an annual Day of Prayer for Peace in Our Communities on September 9, the Feast of St. Peter Claver. “Racism is an evil which endures in our society and in our Church. Almost 40 years ago, the Bishops of the United States wrote a pastoral letter on racism entitled “Brothers and Sisters to Us” and this was the opening line. Unfortunately, this statement still rings true today. The Church has a tremendous responsibility to encourage dialogue and heal tensions associated with the racism in our communities, our nation, and our world. The recent events which occurred in Charlottesville, Virginia reminded us that while many of us may not experience or be aware of racism every day, it exists in many hidden ways. Too often many of our fellow brothers and sisters experience the effects of it daily. These events remind us that racism is real. It is a sin, deterring us from the call to live as children of God. When racism permeates our thoughts, it shows forth in our words and actions, revealing prejudices that prevent us from viewing each individual we encounter as a child of God created equally. 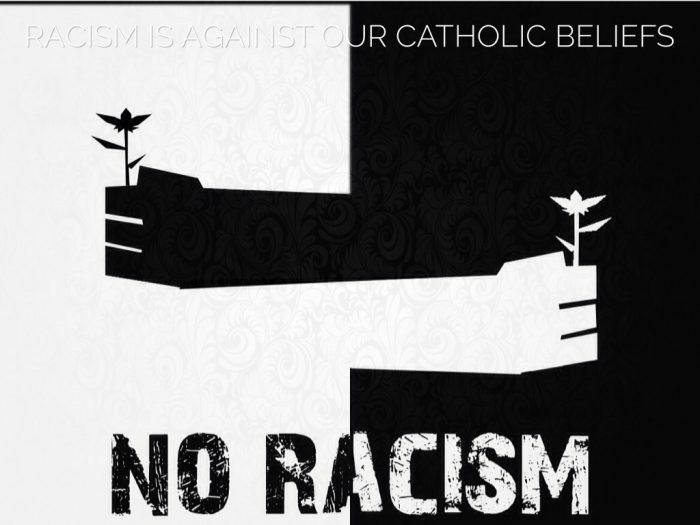 In further response to recent events, on Aug. 23, the USCCB announced the creation of an Ad Hoc committee against racism to address the sin of racism, encourage dialogue and seek solutions. “Recent events have exposed the extent to which the sin of racism continues to afflict our nation. The establishment of this new ad hoc committee will be wholly dedicated to engaging the Church and our society to work together in unity to challenge the sin of racism, to listen to persons who are suffering under this sin, and to come together in the love of Christ to know one another as brothers and sisters,” said Cardinal DiNardo. • The answer is Christ, and Christ calls for our conversion. His first words in the Gospel are, “Repent, for the kingdom of heaven is at hand” (Matt 4:17). • The recent events, and indeed the events unfolding over the last few years, days and hours all point to the need that we, as a nation, as a people, have for conversion. • Conversion requires prayerful self-reflection. As a nation, we need to self-reflect on what aspects of our communal and civil structures actually divide and separate us. How are they covertly racist? As a Church, we need to self-reflect on how we have been unwelcoming to the stranger, the person of a different race, or the immigrant. We need to self-reflect on how we have not challenged the sin of racism enough. More so, we must listen to persons of a different race and listen to the immigrant. And when we think we have listened, we must listen again. We must hear the story and begin to share the journey more deeply. Let us come together in the love of Christ to better know one another as sisters and brothers. • And in order for our nation and our church to be healed of the sin of racism, each one of us needs to reflect and be healed. We may not think of ourselves as racist, or being prejudiced, or intolerant but is that entirely the case? Intolerance and bias can hide in our attitudes and arrogances. Where are the places in our own heart that might harbor hostility, concealed discrimination and prejudice? • Conversion requires courageous and ongoing self-reflection, it requires each of us to examine our conscience humbly before Christ. • We must be contemplative enough to allow the Lord to work in the depth of our heart on these issues. o How have I been silent on the events of the past weeks? o How have I been silent on racism? o How have I participated in words or actions that denigrate others? o What am I not seeing in myself, ignoring about myself that is contrary to love of neighbor, even those I do not know? o What fears do I knowingly or unknowingly hold about people that are different from me? o How do I consciously or unconsciously act on those fears? In my choices, my beliefs, my actions, my attitudes? o How have I failed to do what is right and just? o Have I failed to ask Christ to heal me of all prejudice?